I woke up this morning and logged into my Facebook Account and it just so happens that one of my favorite memories popped up as a memory from 2 years ago. 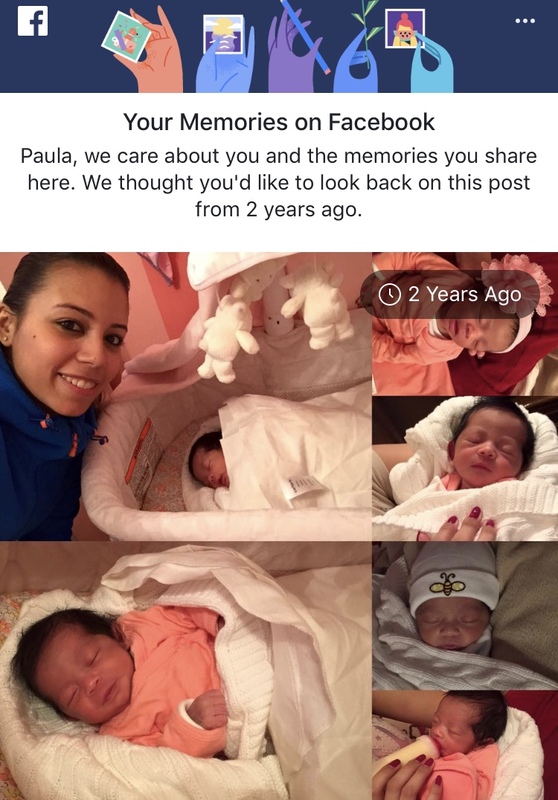 2 years ago today, I met a wonderful little baby named Sophia, which a few weeks later I was given the news of being her Godmother! Sophia is the daughter of my cousin. She's the only girl cousin I have here in the United States. Sophia is such an incredible little girl. Since the moment I first saw her, she literally made me cry. I never thought meeting a little baby was going to get me so emotional. Sophia was born on January 5th, 2016, 2 days before my birthday. I met her on January 12th, 2016 when she was finally home. Sophie was the first baby born since my little brother was born back in 1998. It's been a long time since my family and I were around a newborn baby. As the days passed, Sophie just continued to make me fall in love with her. She's the cutest baby I've ever seen. She's always filled with joy and curiosity. Any second I have her is full of happiness The feeling she's gives me is indescribable and every day I fall more in love with her, which 2 years later I have no idea how that's possible. I'll guide her through everything as she gets older and ill be the best Godmother I can possibly be. She's my world and I'll do whatever I have to do just to see a smile on your face now and forever. Whoever follows my Instagram or my Twitter will see a lot of pictures of her, for the simple fact every time I see her I have to post about her. I'm one of those crazy Godmothers that is always taking hundreds of pictures of their godchild. Sophie is very special to me and decided to just show her off to the world. I felt like sharing with all of you because that little munchkin, who I call my Moana (since they look alike) has such an amazing place in my heart. I love that girl as if she was my own daughter. Esta mañana me conecte a mi Facebook y me salió un recuerdo de hace 2 años. Ese recuerdo es un día muy especial. En el día de hoy hace 2 años, conocí por primera ves a una princesa muy especial que tengo el privilegio de decirle mi ahijada. Esa princesa se llama Sophia. Ella es la hija de la única prima que tengo acá en los Estados Unidos. Desde el momento que la conocí me emocione mucho que hasta se me salieron las lagrimas viendo el pedacito que era. Yo nunca pensé que conociendo un bebe me iba a poner tan sentimental. Sophia nació el 5 de Enero, 2 días antes de mi cumpleaños. Yo la conocí el 12 de Enero cuando llego a su casa. Cada día me enamoro mas de mi Sophie. Ella es una niña muy hermosa y muy consentida. Ella esta llena de alegría y de curiosidad. Cada segundo que comparto con ella son llenos de felicidad. Cuando la veo ni puedo explicar la alegría que siento. La acompañare en todo cuando me necesite y hare lo que sea para verla feliz siempre. Desde el momento que sus padres me preguntaron si yo quería ser la madrina de Sophia, supe que tenia que hacer todo lo posible para ser la mejor madrina del mundo. Ella es mi todo y siempre tendrá un lugar muy especial en mi corazón. Los que me siguen en mi redes sociales de Instagram o de Twitter van a ver muchos posts sobre ella. Cada ves que la veo tengo que subir una foto porque es lo mas hermoso que he visto. Soy de esas madrinas que son locas tomándole fotos a los ahijados. Quise hablar de ella porque hoy es un día muy especial para mi. Soy locamente enamorada de ella y quise hablar de una de mis felicidades mas grande de mi vida. Amo a mi Sophia, mi Moana favorita como si fuera mi hija.